Oriel Sea Salt is recognized for its rare ability to acquire strong taste from 90-year-old Whiskey barrels. SAN FRANCISCO, September 28, 2016/PRNewswire/ – San Francisco Salt Company has partnered with Oriel Sea Salt, which is now accredited under the Protected Designation of Origin (PDO), the most prestigious EU food quality register. Oriel Sea Salt is the second product from Ireland to be recognized under the PDO and is used to craft San Francisco Salt Company’s Whiskey Smoked Irish Sea Salt. The accreditation was received on August 31st 2016. The PDO designates agricultural products or foodstuff that is exclusively determined by the geographical environment they are in. In order to receive the PDO certification, the product must be traditionally or entirely manufactured within the specific region. Preparing, processing, and producing a product in one region is rare and brings out unique properties in that product. The production of the Whiskey Smoked Salt begins with smoking 90-year-old Nicaraguan oak kegs, which hold Teeling’s finest Irish whiskey during its last 10 years of aging. The smoking takes place just hours after the kegs are emptied. This process ensures retention of the rich whiskey and oak aromas, which are then subtly infused into Oriel Kiln-Dried Mineral Sea Salt. Oriel Sea Salt is known for its powerful taste that allows chefs to use less salt and achieve the same kick. 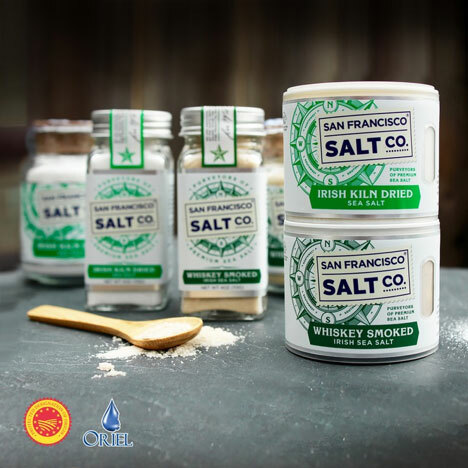 San Francisco Salt Company’s Whiskey Smoked Irish Sea Salt is available in bulk packages for restaurants, hotels, bars and other volume customers as well as three retail-sized package options: 4-ounce glass shaker bottles, 5-ounce stackable shakers, and 8-ounce glass chef’s jars with wooden scoop. The line can be purchased online at www.sfsalt.com or by phone at 1(800)480-4540. Launched in 2002, the San Francisco Salt Company was the founders’ entrepreneurial dream and embodies his principals of quality, value, and customer service. They carefully select only the best quality salts from suppliers around the globe for their taste, texture, and appearance. For more information, please visit //www.sfsalt.com/ or find the brand on Facebook, Twitter, and Instagram.